Creating a beautiful yard starts by changing your mindset. It’s time to move from plain old vanilla, status quo landscape maintenance, to a more dynamic one known as Fine Gardening. Well, take heart. A beautiful yard is within your reach. And it starts by changing your mindset and your approach. It’s time to move from plain old vanilla, status quo landscape maintenance to a more dynamic approach known as Fine Gardening. We hope you enjoy reading The Fine Gardener’s Guide to a Beautiful and Luxurious Landscape eBook. A beautiful yard is within your reach. And it starts by changing your mindset and your approach. It’s time to move from plain old vanilla, status quo landscape maintenance to a more dynamic approach known as Fine Gardening. Download your personal copy of the guide. First, it’s important to clear up any misconceptions about what Fine Gardening is. What it is NOT is casually wandering through a manicured Victorian landscape, snipping a lovely flower or two off an elegant heirloom rose bush and listening to the lazy drone of honey bees. No, not that at all. Though we are aiming for those moments to occur! Fine Gardening is all about achieving a fine-tuned equilibrium between what nature wants to do and what you’d like to achieve in your personal outdoor oasis. It’s the practice of managing the natural environment around your home so that it will be healthy and vibrant while also keeping your sights set on the aesthetic balance of form, texture, and color. We all know that landscapes are made up of living things, but there is often confusion about how to manage them. And make no mistake about this, if you plan to live and play in the outdoors around your home, the space will need to be managed. The question is how it’s managed. Conventional landscape care maintains a status quo, season to season and year to year. It keeps chaos at bay, which is good and needed, but it doesn’t do much more than that. A conventional landscape tends to include lots of the basic features that can unintentionally become uninteresting. Same old shrubs that need to be trimmed every year. Same old trees that need to be pruned, beds weeded, grass mowed. Variations on shades of green with maybe a little color thrown in here and there. The danger is the landscape becomes boring, boring, boring. Conventional landscape care is reactive. Shrubs get shaggy and get trimmed. Grass grows and gets mowed. Weeds pop up and get pulled. Many homeowners make the mistake of thinking their landscape should be static, frozen in time. They strive – and struggle – to maintain a clipped, trimmed, constant appearance with scant regard for the life cycles of all the living elements that make up their landscaped environment. As a result, much of the effort put into landscape maintenance is done in big, broad strokes – mowing, leaf cleanup, mechanical trimming, mulching, snow removal. Tasks designed to try to hold nature at bay and ensure that we can move about our properties safely and comfortably with a modicum of management. Again, I’m sure you can read the value in this work. Hopefully, you are also starting to see why, longterm, it can become less than satisfying to have this be the only outcome of the effort. A Fine Gardener pays close attention to the horticultural needs of the landscape because they exist in a unique ecosystem that is ever-evolving over time and with the environment. In truth, landscapes don’t take kindly to being frozen in time. They prefer to be “Life-Scapes” – dynamic, ever-changing environments in which the living elements respond to natural biological processes as they grow and mature. This is the foundation of Fine Gardening. A Fine Gardener has the ability and desire to think ahead, responding and working with Nature – anticipating her – rather than reacting to her. The goal is to work in partnership with the natural elements in the landscape to help them evolve as a unified whole – a beautiful, sustainable, thriving, environment. To accomplish this requires efforts more focused than most of the work put into conventional landscape maintenance. Think of precise moves: planting, pruning, deadheading, dividing, edging, transplanting, staking, and yes, even weeding. A healthy, natural ecosystem needs these precisely focused efforts to better manage the complexities of a designed space. To balance out the inequities and maintain a high level of performance to achieve optimal beauty and comfort. A unique element of this practice is that Fine Gardeners, while deeply interested in the health and well-being of the plants and soils in their care, are also deeply interested in the look of the garden and the landscape as a whole. Fine Gardeners know, that how a place looks is tethered to how a place feels and how it is experienced. The three important gardening principles of order, health, and aesthetic together make up the foundation of a deeply pleasing and restorative space. It’s easy to overlook how nature-deprived our society is becoming. Digital technology, time constraints, overbooking, and increasing responsibilities at work and home all conspire to keep us inside. This is becoming such a societal problem that medical professionals have coined a term for it: nature deficit disorder. And while it’s not meant to be an official medical diagnosis, it does describe the impact of our alienation from the natural world. Integrating Fine Gardening with traditional landscape maintenance will enable you to create and sustain a well-organized, healthy and beautiful home landscape that will not only make you proud but restore your spirit and provide peace-of-mind. Creating a deeply appealing, peaceful, personal outside environment at your home will encourage you to get outside more often. It boils down to this: spending time in nature makes us happier and healthier. To begin, you need to consider the three aspects of Fine Gardening care to determine what you’ll need to do as well what you might want to do in any given year. Keep in mind, when you Fine Garden, you are employing a critical thinking mentality to your land management program in order to get the biggest bang for your investment of time and money. Much of the care tactics will depend on plant age and wellness, the property location, the time of year and even the specific year. This is what makes Fine Gardening a unique practice. It requires an understanding of seasonal cycles and the life cycles of each unique plant, as well as the current state of the environment, right down to the state of each garden area and how they evolve. This is the baseline that must be maintained to ensure your landscape thrives. At The Garden Continuum, we know that these steps cannot be skipped and must occur each year to maintain the investment in your beautiful home landscape; your Life-Scape™. Keep in mind, MTC work is done in addition to the basics of Landscape Maintenance (mowing, leaf & snow management) if you want to truly experience a thriving environment. Enhancing your landscape with added efforts and additional elements is a choice that you can opt to accomplish during any year. All of these tasks and elements will boost your landscape to the next level, but not all are needed every year. Some can become annualized efforts while others can be added in only when needed by the plants and ecosystem, or when you desire them. For example, planting summer annuals can add color and vibrancy to your landscape that perennials and shrubs can’t; they can be added annually or just for a special occasion. The important task of tree work (pruning, treating, cabling, etc.) does not need to be included every year for every tree, but trees should be assessed yearly and then managed over time. There are always opportunities to refine existing elements or to develop a new aspect of your landscape by expanding upon existing areas or creating new ones. Looking at your landscape through the Fine Gardening lens keeps the potential for refinement on the table annually as a way to keep pace with Mother Nature. It’s also a guaranteed way to keep your interest, excitement, and engagement with your landscape fresh and alive. Refinements could be something as simple as expanding a bed area to accommodate the growth of plants that are thriving. Or, it could be the removal of a planted space to simplify a section of a landscape or respond to increased shade from the expanding canopies of large trees. New aspects could be the installation of a new shed, adding a patio, creating a vegetable garden, or adding low-voltage lighting to brighten up the evening hours within your landscape. It could be as simple as installing two well-chosen planters to highlight your front door in each of the four seasons. Life and work keeps us busy, so it’s understandable that your landscape isn’t on your mind all the time. An annual assessment of your landscape gives you the opportunity to consider ways to improve it and thereby improve your experience in it. Whether you do this alone, or with a trusted Fine Gardening partner, this is a critical step in managing the outdoor spaces that are integral to your home. Fine Gardeners want to nurture both the plants and the soil to achieve high performance over time. That performance is connected not only to ecological health, it is also tethered to the presentation of the garden and whether that pleases the garden owner. As they say, beauty is in the eye of the beholder, so that means that it lives on a continuum of expression stretching from formal order to wild order. It is up to the Fine Gardener and landowner to determine where on the continuum the landscape will live. To this end, the Fine Gardener will make changes and subtle shifts within gardens, keeping the original design intent in mind. While doing so, they will keep a firm watch on the evolution plants and how that affects the space and its uses over time. The ultimate objective is to nurture the landscape so it is brilliant and vibrant as it matures and changes. Fine Gardening requires the regular consideration of the following six areas of management. Don’t leave any of them out or else your landscape risks deterioration into chaos. If you need help, partner with a professional service provider to augment the work you plan to do. 1. Edging beds – Cut lawn edges to demarcate planting beds and lawn areas and keep the lawn from spreading into what it considers empty spaces. In some cases, perennials and groundcovers want to return the favor and spread into lawn spaces. The goal is a healthy cohabitation without invasion so that there is a neat edge with a well-shaped flow that draws your eye through the landscape in a gentle and pleasing way. 2. Pruning woody ornamental plants – Trees and shrubs should be pruned at the appropriate time in their growth cycles. Not all plants can or should be pruned at the same time, so be aware that spring, summer, and fall pruning needs are different. There are times when we will suggest that plants be pruned in the wintertime as well. Additionally, all plant types are not pruned in the same way. Understanding horticultural differences is critical in getting this job done right. 3. Deadheading/Dividing/Transplanting/Removal – Gardens mature and age over time at different paces, which means that plants may need varying attention over the seasons as they mature and respond to seasonal fluctuations. Light trimming and deadheading of herbaceous plants (like perennials) is necessary as these plants move through their normal flowering cycle. Older, more mature plants may be in need of heavier-handed attention if they become too big or are no longer performing well in a location. Dividing and transplanting perennials that have outgrown their current space can make more room in the old location and provide an additional plant to utilize in other, open areas. Moving out shrubs to make more room and fill new spaces can be extremely effective in getting more performance out of an area and the plants in that garden. Most often this kind of work is done in the spring and fall. 4. General Weed & Bed Management – Weeding is a necessary “evil” that should not be avoided. Good bed management also means managing moss and overly aggressive perennials and woody plants that are seeding themselves in the landscape. The goal is to keep the garden managed so that undesirable plants never get a foothold in the soil or, worse, entangled in the root systems of the desirable plants. If you skip weeding, you ensure that the problem will increase. This is because weeds also have a flowering and seed setting cycle (just like the desirable plants). When they are left unchecked, those weeds repopulate the soil with more seeds to germinate in the next season and many seasons thereafter. It takes only one seeding to create weeds for several years to come. 5. Soil Health & Remediation – Soils deficient in organic matter, minerals, and/or nutrients should be treated to improve conditions for plants. Fall applications of lime may be needed to improve vitality and performance of ornamental garden areas. Soil testing is highly recommended to understand the soil chemistry more fully and to determine appropriate fertilization programs as well as more steps for soil remediation. Simply adding fertilizer on a yearly basis is not only ineffective, it can be costly. Organic compost is suggested for use with all plantings/transplantings. Organic mulches – simple undyed bark and/or leaf mold -- is recommended as a follow-up to all of the above work. Balanced soils help reduce or eliminate moss, yellowed leaves, insect predation, and at times even helps reduce weeds. Most important, healthy soils have a better chance of supporting plants through times of drought. 6. Watering strategies – Proper hydration is one of the key ingredients for a healthy landscape. Proper hydration promotes healthy soil, supports the right plants in the right places, and helps provide adequate acclimation time for new plants. Plants should only be moved if the homeowner is able to reliably monitor and water them. It should be noted that irrigation systems are not adequate for watering transplants. They also should not be set and left unchecked -- this is a root cause of much of our seasonal water shortages. It’s important to be aware of factors that may impede proper hydration, such as competition from trees, overcrowded plantings, and areas over-exposed to the elements, to name a few. If this is the case, a change in plant care strategy may be necessary. First and foremost partnered care is the best way to deal with any endeavor that is complex; comprised of many moving parts. No one person can be an expert in all of the elements of our landscapes. To be sure, a partnership is the way to achieve the best possible performance. Anyone endeavoring to develop a landscape at this level is keenly aware of its intrinsic value to protect and even improve an asset while also becoming a source of personal enjoyment and satisfaction. What may not be as evident, is how an investment in this level of care can feed one’s soul, produce a restorative energetic, and thereby deeply improving one's life. Just like a well-appointed home with carefully selected amenities, furnishings, and decor pieces brings satisfaction, so too will a well-appointed landscape. If you already love the inside of your home, shouldn’t you love the outside too? The Garden Continuum specializes in partnered Fine Gardening landscape Care with homeowners. Partnering enables us to supply care at the level best suited for you and your landscape. It also enables us to dovetail our specialties with other landscape service providers with whom you may be working. In our family of clients, we have active gardeners who spend many hours in their own landscapes each month. And we have garden enthusiasts who would like to spend more time in their landscape, but life doesn’t allow them the time needed to do the necessary work. We also have clients who appreciate the value of their landscape and all its gardens have to offer but have no interest in doing the gardening tasks themselves. There is no right or wrong answer or approach, just different lifestyles and needs. By using the information shared here, we hope you can start to get a feel for what your land management needs are and how you can tend to them. For each person who owns a parcel of land - of any size - the trick is to determine what you can or can not do personally based on your time, skills, and desire as the first step to understanding your landscape care needs. Next, you can start to identify what level of outside help you’d need to create the landscape you’ve always imagined. Developing strategic partnerships with industry professionals is a surefire way to have it all. If you’ve never worked with a Fine Gardener, we encourage you to give it a try. Scheduling just one day of professional care can make a significant difference that we are certain will surprise and delight you. Once you see what a team of professional Fine Gardeners can accomplish in just one small slice of your landscape, we can talk about developing a custom Fine Gardening care program that will transform your everyday landscape into an exceptional Life-Scape that is tailored perfectly to you. 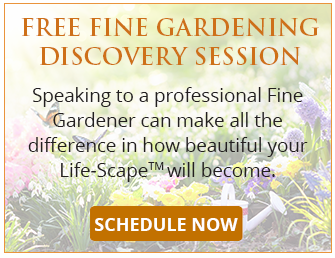 To get started, schedule your Fine Gardening discovery session today.